Many homebuyers prefer an empty yard to build a pool to their personal specifications. But for homes that happen to come with swimming pools already in the ground, take the right steps to protect your investment: Before closing escrow you will want to know about the pool and the condition of its structure and equipment systems. Whether or not you’ve previously owned a home with a backyard pool, it’s important to arrange for an expert evaluation of the condition of the pool at the home you may soon call your own. Just like a house typically undergoes a professional inspection before escrow closes, so, too, should a pool and spa. A thorough pool inspection should assure a potential buyer of several key issues, ranging from the elevation of the deck surface to the functionality of the pool pump. Although some mortgage companies require a pool inspection before funding a home purchase, state or municipal regulations typically do not. In addition, while a good certified or state-licensed home inspector may add the pool onto his or her checklist for review, don’t count on it. Even if your home inspector does include the pool, that evaluation may not be enough: Due to the complex nature of an inground pool’s structure and its specialized mechanics, pool-industry professionals strongly recommend hiring a specially trained pool inspector. Swimming pool inspectors: Is it worth hiring one? Before interested buyers complete the purchase of a home, they typically hire a home inspector to evaluate the house’s condition. Inspectors review a variety of elements ranging from the functionality of light switches in the bathrooms to the condition of the home’s foundation. Inspectors provide a written report of their findings, which includes a list of any areas of concern. For example, the kitchen-sink garbage disposal may malfunctioning, or the paint could be peeling off the front door. After the buyer’s inspector presents a checklist, the buyer and seller can negotiate on the items. The seller may agree to fix all or some of the items, the seller may provide a price credit to the buyer, or the seller and buyer may agree to a combination of repairs and credits. If a home has a backyard pool, it too should be part of the same review process. However, not all home inspectors are well-versed on how to properly evaluate a pool’s condition, according to San Diego-based swimming pool consultant Rick English. English adds that swimming pools have a lot of complicated parts with which an inspector needs to be familiar, such as pumps, filters, and heaters. Many pools have additional equipment components and specialty accessories. With this in mind, English advises potential home/pool buyers to check with their local chapter of the American Society of Home Inspectors (ASHI) for a referral to experienced swimming pool inspectors in their area. “Ask ASHI, and don’t necessarily just rely on a realtor,” he says. Like a home inspection, a typical pool inspection might cost a few hundred dollars. However, highly experienced pool inspectors with more specific knowledge may charge a higher fee, perhaps as much as $600. This level of inspection is worth it, according to English, especially if you receive an itemized report with dozens of pages of in-depth information that a homebuyer can use to barter for credit on the overall purchase price of the house and pool. With this in mind, let’s take a look at five primary areas to examine during an in-depth pool inspection. An inspection will determine if a pool complies with local safety regulations, which vary state to state and from municipality to municipality. Your pool inspector should be well-versed in any local regulations. For example, a common pool-safety mandate is a permanent perimeter fence at least 5 feet high that surrounds any accessible perimeter of a pool. The fence gate should open outward and have a self-closing, self-latching lock. Local regulations may also require that homes with pools have other kinds of safeguards, such as alarms on all doors and windows that lead to the pool; safety glass on any windows five feet or less from the water’s edge; a pool cover that can hold stable if a child walks onto it; or an alarm that activates if someone touches the pool water. Remember, even if a requisite safeguard is not in place, there are ways to address this shortcoming. You can ask that the seller to either remedy the issue or provide you with a credit on the final purchase price so you can make the addition as needed. Some wear and tear on a pool may be easy to see. However, an expert will know what to look for in terms of deterioration. He can identify and assess the necessity and likely cost of making repairs or replacing certain materials. Among the key physical factors to inspect are those you see every day, such as the interior finish. However, what matters too are the less-obvious ones, such as the grout between stones in the rock waterfall or uneven spots in the deck. Here are some of the key features your pool inspection should cover. The finish that goes on an inground pool’s interior is usually referred to as plaster. The three major types are marcite (white Portland cement mixed with finely ground marble); quartz aggregate (a step up from marcite that includes granules of natural quartz); or pebble (the top tier of pool finishes with the highest durability, aesthetic quality, and price tag). The finish on a pool should be generally uniform, and free of stains, major streaks, discolorations, or areas that are rough or mottled. Do note that some kinds of stains are relatively simple and affordable to remove, while others require draining the pool for a major acid washing to attack the unwanted blemishes. You may see hairline “spider web-like” cracks. The good news is that these are normal with aging finishes. A professional inspection should help determine if any cracks appear to be serious or—in rare cases—are an indication of underlying structural issues. Colorful tiles are used along the pool’s waterline to help waterproof the pool structure at the perimeter and as a decorative element. Pool builders also set tile on any raised bond beam (walls raised above the pool surface) and areas such as the façade of an elevated spa. It’s fairly easy to assess the condition of pool tile. The grout, the mortar or paste material between each tile, should completely surround each tile and be in good condition. Look for chips and any corners where grout has deteriorated and exposed a sharp angle. After all, you don’t want any loose tiles falling off or a curious child or adult playing with a corner edge and scratching their fingers. It’s also smart to take a good look at all of the tiled areas, and scrutinize each section for any individual tiles that appear to have been replaced, but don’t closely match their neighbors’ color and pattern. In some areas of the country, decking cantilevers over the pool’s perimeter edge. However, in most regions, pool perimeters have coping. Typically, coping runs 12 to 18 inches in depth. It’s is a decorative element that comes in a wide variety of materials, including brick, natural stone, premade concrete coping stones, or colored concrete pavers. The expanse around the pool defines the pool’s shape, and it separates the surrounding deck from the pool structure itself. The coping material should be stable without loose or seriously chipped pieces. The grout between each piece should be in good condition. There may be mastic, a sealing material between the coping and the deck, and this should be intact to provide a waterproof seal. 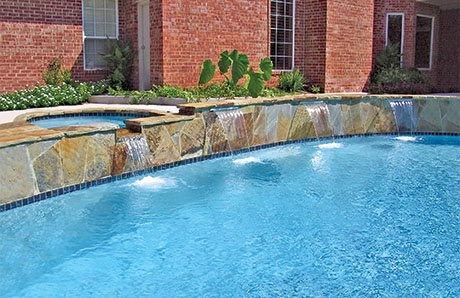 Your pool inspector will also look for coping pieces with stains or cracks. A number of major or deep cracks could indicate that the deck is shifting. That’s a potential problem, and your expert will advise if troubles could be minor or more serious. Unless there is bare ground or grass lawn serving as the deck don’t overlook the hardscape that surrounds your pool. Of course, you want to assess how the deck looks in terms of the surface, the color, and the overall condition of the stone, pavers, concrete, wood, or other materials from which it was built. But you also want to look at the deck’s position. Is it pitched properly so that rainwater or pool-water “splash-out” travels away from the pool and off to a proper area for effective drainage? Or, are there any drains built into the deck to route away the water, and if so, are the drains clear and functioning? In a serious case, large gaps of space between the deck and the ground below can lead depressions, or worse, lifting—a costly problem; depending on the deck material, lifting may require a partial or full deck replacement. You will also want to assess the line-up and condition of the equipment that runs your potential new pool. If you were buying a used car, you would want an expert to check under the hood, and the same is a smart move for a “second-hand” swimming pool. Now, during a pool inspection you can’t take equipment apart. But you and your inspector can take it out for a test drive. Turn on all of the systems, and observe them at work. Check if the parts on each component are secure. Listen for any that make unusual noises that may point to mechanical issues. Do the systems appear to operate correctly by creating the desired effect, such as water circulating or lights activating? The chief pieces of pool equipment that warrant you and your inspector’s close attention are those that operate key functions: the pump, filter, and if present, a heater. A pump serves as the heart of a pool’s equipment system. It provides the needed water flow for filtration and circulation, which help maintain a healthy swimming environment. The pump also helps operate pool features, such as waterfalls or pool cleaners. An inspection should ascertain that the pump is bolted to the equipment pad and that it’s free of leaks. It should be properly wired and grounded with a ground fault interrupter (GFI). The time clock should be working properly as well. For your monthly utility bills, it’s worth noting the type of pump on the pool: Is it single speed, two speed, or variable speed? Two-speed units can save up to 70 percent on energy costs, and variable-speed ones save even more! The pool filter captures dirt and debris from water passing through it. Filters fall into three categories: sand, cartridge, and Diatomaceous Earth (DE). The cartridge designs consist of cylindrical tubes of pleated fabric that sits inside a storage tank, and they are increasingly popular among homeowners for convenience and environmental reasons. English says that he often recommends them to prospective buyers, and advises that for energy efficiency, the pool should be using the biggest cartridge possible. Large pool cartridges also save water, and the biggest models can go as long as a year before needing a cleanout. A good pool inspector will make sure that the gauge on the filter works properly. And he will also check to make sure there are no defects in the clamp to the filter tank that could cause it to fail. The pool you are buying may or may not have a heater. They are a costly item to purchase, so it’s important to take that into consideration if no heater is present and you plan on using the pool beyond the hot months of the year in your area. And if the pool comes with a heater, you want to know you that it’s unlikely you will have to replace it anytime soon. The most common kind of heater runs on natural gas, although some regions and neighborhoods rely on propane. In some parts of the country, solar pool heating is a popular option; in others, an electric-powered heat pump is a common choice. During a pool inspection, it’s critical to verify that the heater—like the pump—is properly grounded. The inspector will turn on the heater to make sure it is succeeding in boosting the water temperature. Gas heaters come in different sizes. Your inspector will consider if the heater size is appropriate for the water volume of the pool, as that’s critical for efficiently and quickly warming the pool. With energy use in mind, be sure to check that the unit has a thermal efficiency rating of 90 percent to 95 percent. If the pool has other optional design, comfort, and convenience features and upgrades, you will want to review them thoroughly. Whether it’s tanning ledge or alternative purification system, you want the condition examined. Here are some typical features and accessories. Spas are a wonderful addition to most any pool. Test the spa blower and check that is has a properly operating GFI and is grounded. Check that it’s wired correctly. When turned on, does the blower appear to provide adequate air to the spa’s hydrotherapy jets? Check that each jet delivers a balanced, strong output. A superb safety and water-saving tool, an automatic pool cover is an expensive accessory you will want to be sure is in good working order. Does it open and close smoothly? Are any parts wearing out? What’s the condition of the cover material? Your inspector will check that the base unit uses proper wiring, and they will advise you the number of different pieces of equipment and features is designed to operate. Each of the buttons and any group program should appear to work: For example, will the unit activate the lights, cleaner, pump, heater, and other equipment that it’s supposed to? Does it turn any water features on and off? You may be fortunate to have a pool with the ultimate in convenience: An automation system that’s upgraded to work with a handheld remote or an internet-compatible PC or mobile app. If so, check their functionality. And if there’s handheld unit, perform a test to make sure it works from inside the house. Accessories like diving boards and slides are fun, but if improperly installed or in poor condition, they can pose safety issues. Be sure your inspector thoroughly assesses them. If you want to consider removing the item altogether, consider how it’s attached to the deck on what the deck might look like after you have the item removed. Fountains, bubblers, laminars, deck jets, cascades, spouted, waterfalls, and grottos provide flowing liquid flourishes to any pool. However, they can also leak. Or, the features may have some water missing its mark. For example, a malfunctioning or poorly calibrated one could send some water off to the deck instead of back into the pool. Bonus tip for natural stone waterfalls: Check out the condition of the grout used to hold the stones in place. If the pool has an infinity edge (also called a vanishing edge or negative edge), the pool inspector will check out the pool hydraulics to see that the recirculation to the catch basin is correctly working. Advanced LED lighting systems provide many, many years of energy-efficient illumination before burning out, so this technology is vastly superior to old-school incandescent lights and it rarely poses issues. But of course, your inspector should check that the LED lighting works, and that any color-changing light shows activate as well. Inquire if there is technology on the pool that offers an alternative to traditional chlorine. Options include chlorine generators (salt generators), ultraviolet germicidal light, and ozone systems. You want to be sure the system is sized and properly plumbed into the equipment and is working effectively. A variety of other conditions and systems can affect an inground swimming pool. And inspection may uncover other issue or factors for you to consider. Supporting the pool equipment and its overall operating are electric runs and plumbing lines. For example, your inspector will check that the breakers are properly labeled. He will check if the plumbing lines at the equipment appear to be free of leaks. He will check for bubbles in the return lines, which could be a clue to a suction leak. The best inspectors might look at surrounding variables as well. Proper drainage is an important one. For example, if the pool is located close to the house, it is important to to note gutters on the roof. Why? Depending on their position, they may empty rainwater onto the ground below—where it will gather and likely overflow into the pool. Inspectors may point out other factors. They might let you know that the wind coming off the canyon will constantly blow dust into the pool. Will the beautiful trees block much of the sunshine you want by the pool, or will the trees heavily shed leaves that you will need to clean out unless you have top-flight automatic pool cleaner? Of course, you can always pass on the house with a pool. Many home buyers who want a pool prefer to find a house without a “second-hand” one, and instead hire a builder to design exactly what they want from the ground up. That’s always an option. But if you find the ideal home with a pool already in place, be smart about obtaining a full evaluation. With all of the intricacies involved in assessing the condition of a swimming pool, conducting a comprehensive evaluation without the help of a pool inspector can challenging. By engaging a trained inspector or pool professional, you will get an expert’s highly valuable advice. You can relax, knowing that any mandated safety features are in place. You will be confident that the physical components are in good shape and that major equipment systems are in working order. Or, you will learn if any structural or mechanical components may need repair, replacement—or in lieu of them, a buyer’s credit in the home purchase price. “Get an inspection done that goes above the normal standards of practice,” San Antonio’s Jackson reiterates. Yes, a pool inspection is optional—but it’s a process worth the time and investment. The result will be peace of mind and a new home with a stable, properly functioning backyard resort.